I have a major problem with director Joe Wright. I think he is a technically accomplished director who creates wonderfully fluid, extravagantly choreographed shots that are entirely at odds with the content of his films. I first noticed this in ATONEMENT, where his long tracking shot on the beach at Dunkirk didn't advance either plot or character - it was a showy distraction in what should have been (viz. the novel) a tightly structured, chamber drama. 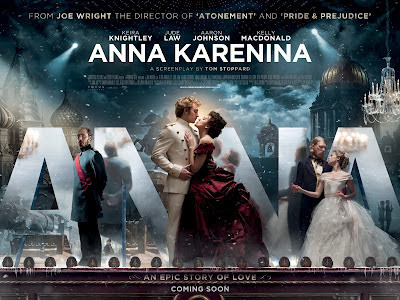 Sadly, in ANNA KARENINA, this desire to be as contrived and artificial and intricately choreographed as possible has over-taken the film to the point where all passion, tragedy and joy is lost in a never-ending series of delicate backdrops that showcase the Chanel Haute Joaillerie collection. This film is not so much a tragic romance as a musical without songs, and a perfume advertisement that lasts two hours. I am not entirely sure who is to blame. Who was it that came up with the conceit to imprison what many have called the greatest novel ever written in the simplistic straitjacket of a theatre metaphor? Was it Joe Wright, or playwright/screenwriter Tom Stoppard? In their version of 1870s Imperial Russia, high society becomes a theatre in which every aristocrat has a part to play, and rules to which they must confirm, or else be brutally cast aside. This is the lesson which Anna Karenina learns when she sacrifices her son and her marriage to have an affair with the dashing Count Vronsky. He also loses - his Commission, his freedom, the respect of society - but not as much as Anna - because he can still contract a good marriage and so redeem all. Both Anna and Vronsky learn that happiness is tarnished by the exigencies of real life, and ultimately, they are made wretched by each other and their situation. The intensity with which Wright and Stoppard used the theatrical metaphor is dazzling in the open twenty minutes of the film - so ingenious it quite crowds out our attention. I barely noticed Anna and Vronsky fall in love, or Kitty's heartbreak when Vronsky leaves her for Anna. Anna's brother Stiva becomes a caricature of a decadent aristo, like a larger than life minor comic character in Dickens. I kept waiting to see marionette strings. And as for the production design - it was so rich and beautiful as to be claustrophobic, and then became a parody of itself, with Princess Betsy turning into Effie Trinkett from THE HUNGER GAMES with her outlandish dresses and coiffeur. Underneath all the anachronistic dance moves that distracted with their inelegance and artifice, I detected what looks to be a more mature and nuanced performance from Keira Knightley, and especially Jude Law as her dogmatic husband Karenin. Too bad those performances didn't have room to breathe. But as for poor Aaron Taylor-Johnson, his Vronsky was never more than a vain poseur. When never feel and see his love for Anna, and his motivations are not rich enough - either in respect to Anna or the eligible young Princess Sorokina. Maybe it's the fault of the script, but Jude Law did better with less. The result is a film that looks fabulous and moves with the intricacy of a Swiss watch, but which feels insubstantial and skates over us too lightly. Perhaps it's because Vronsky is so poorly written. Perhaps it's because the larger, metaphysical discussion is entirely absent. In the novel, Anna's attempt to escape society's constrictions is contrasted with the gloriously good but conflicted and occasionally delusionally idealistic Levin, who flees to the country but never quite loses sight of the dark backing to the mirror. We see nothing of Levin's confusion, nothing of Kitty's process of maturing, nothing of his happiness and final equivocations. Short-changing this story might have seemed like a narrative necessity in a two hour film - editing the "secondary" story to give Anna and Vronsky more screen time. But it's a fatal cut. Anna's story works in relation to Levin's. And, indeed, it's possible to see ANNA KARENINA as Levin's story after all. Without it, the film has none of the intellectual heft of the book - and it loses perhaps the best description of happiness in literature. Still, given these constraints, I have to say that Domnhall Gleeson was absolutely superb as Levin. I just wish I'd seen more of him. Of course, I am well aware that after my tirade against TINKER TAILOR, I might be giving the impression that I have a pantheon of novels that have become so much a part of my life that I cannot conceive of a film-maker's interpretation that would do my vision justice. Not so in the case of ANNA KARENINA. I admired the 1997 Bernard Rose adaptation, starring Sophie Marceau, Sean Bean and Alfred Molina, very, very much indeed. ANNA KARENINA played Toronto 2012 and is released this weekend in the UK and Ireland. It opens on November 16th in the USA and on December 6th in the Czech Republic, Germany, the Netherlands and Portugal. It opens on January 3rd in Russia and Turkey; on January 10th 2013 in Denmark; on January 17th in Australia; on January 24th in Australia; on January 31st in New Zealand and Brazil; on February 14th in Argentina, Norway and Sweden; on February 21st in Italy; and on March 13th in Belgium and France. I completely agree; you've put my exact thoughts into words. Honestly I can't say I didn't expect Wright to cut the secondary characters back as he did, but nonetheless I was disappointed. In my opinion, Anna Karenina doesn't make sense without Levin. Cutting out Levin and Kitty's story cuts out the intellectual substance of the novel, and you're left with basically a soap opera.